This weekend I have been busy working on my home office. 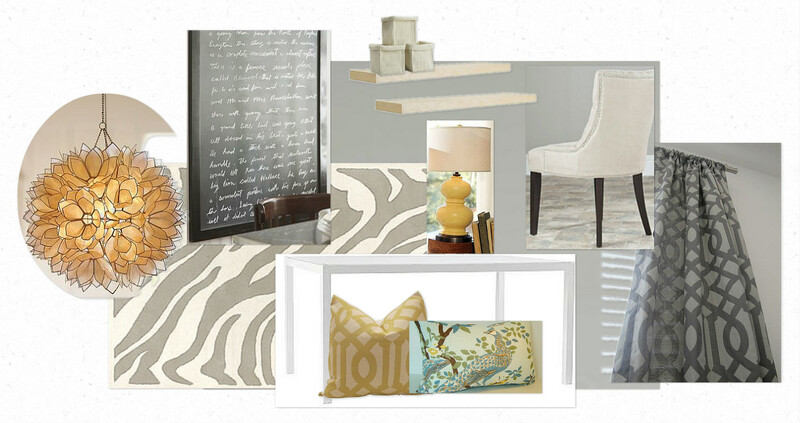 Today I wanted to share with you the office inspiration mood board that I created for the space. Gray is my favorite color. So, of course, when I decided to create a space where I was going to need to be inspired...I chose gray as the jumping off point. I'm keeping the desk very simple...clean lined and white. I love the idea of a zebra print rug...it adds a bit of whimsy without being over the top. I'd love to add in a pretty chandelier and I am absolutely in love with this capiz shell version...it looks like a big old flower to me! I already have the oversize chalkboard that we made for our last house, and I think it would be a great place for me to keep my "to do" lists. Of course, what office would be complete without shelving? And the curtains and pillows for softness. Can't wait to share the room with you ...so I'll keep on working. Hi Wendy! Thanks for sharing your inspiration board with us...great ideas! I have a question...where do folks make those room boards online? I really like seeing them but don't know how to make one myself. Can't wait to see your office. Miss Kitty, I was about to ask the same thing! Love those gray patterned curtains! I've been looking for some for weeks and hadn't come across just the right ones...of course until today when I ordered red curtains instead which were on clearance at Pottery Barn and not returnable. In the 3 hours since that purchase I've seen two gray curtains I like! Oh well, maybe another time. Enjoy your office makeover! OMG! you don't even understand! you just did the work for me!!! I have been in a dilemma for the last 1.5 years as to what accent colours I should throw in my grey room! i have those trellis curtains believe it or not! and I have thrown in some 'yellow' (like the one you use in this moon board' but wasn't' sure what ELSE to do.. and TAAAADAA!! I love it. thank you a bunch! this is it you made up my mind. I have the curtains Like I said.. I just did a DIY lamp for my light and I just bought some lamps from Value Village to give a face lift but held off because of the colour issue.. but no more! I now can proceed with confidence as to what it will look like.